I can’t say I should be surprised about it. After all, I’ve seen it happen time after time to other people and even to myself on occasion. 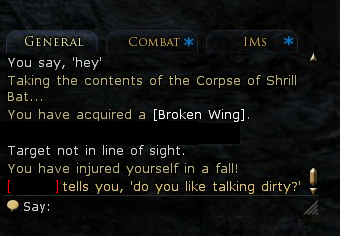 Casual sexism happens in life and, more often than not, in MMOs as well. It’s the disgusting side effect of allowing anyone with time to enter a game and speak their mind about events or the appearance of other characters in the game. This time, however, it was not that it occurred at all, which I was expecting, but how fast it happened to me: 45 minutes into trying out Lord of the Rings Online. I usually play as women in games. Given the choice, I nearly always choose anything that is non-male and usually do so for one simple reason: I know what it is like to be a guy. I want to see something different. I have read enough fantasy and science fiction to be able to project the hero’s journey into the game. I know what it is like, or have read enough to imagine, being the barbarian slayer who must win the girl. I want to see what it is like from the other side, and so I try to live those virtual lives. In trying LOTRO, I was particularly interested in chasing after the story of Lúthien Tinúviel. I’m familiar with The Silmarillion and, upon seeing that the class of Minstrel was based on her, knew I had to play as that. Being able to sing my enemies to death struck me as an interesting way to do battle and, of course, since I was basing my identity off of Lúthien anyway, I needed to create a character that would match her. Using Arwen as a base (think Liv Tyler of the films), I went about making a character that was modeled after her. Then I entered the world of the game. The first 30 minutes or so was me getting through the first tutorial area and getting access to one of the more open areas of the game. I passed through the highly straight forward, welcome-to-a-MMO content and finally got to run around with other players. I even quickly discovered that, despite it being a massively multiplayer game and even free-to-play, there were very few people around. Part of that might have had to do with the late hour at which I was playing, but I imagine most of the servers have a similar load. I was curious then to see what might be like to play in a group as I had on numerous occasions during my time in World of Warcraft. My reaction to reading that moved quickly from confusion to comprehension. Oh. This person was making an association between the character and me. If the avatar was attractive — and I had sought out to make her so — then I must be. Or, more abstractly, if the character was a woman, then I must be as well. After all, people only play as their same gender, right? In this case, as in many, no. Not only was I not a women, I suddenly became very sad for the coming occasions of anyone else playing this game and running into this person after me. Even discounting the fact that this person was looking for a woman to “[talk] dirty”, as was my assumption, this same person was propositioning people in a cave and away from the crowds, small as they may be. Even removing gender from the discussion, the action was bizarre and uncalled for given the context. Even if I wasn’t the woman the person thought I was and even if the person is not a man I think he is, I could not reconcile the actions of hunting bats and talking dirty — but that might just be me. What was far more distressing, as I noted above, was the timing. I have had episodes like this happen in WoW, even on a regular basis back when I use to play daily. But that, I had thought, was more more to do with me having decent gear and often playing the game solo. The times were hundreds of hours into that game and spread out over months. For me to go into a game and in less than a hour run into this type of behavior has put me off the game for several days. Even now, thinking about going back, makes me question often this happens to other people. I’d like to think we have gotten past thinking players are their characters, but then I wonder about the performativity aspects to this exchange. Was it just that I looked like a woman or more than I acted like one too, even if it was a limited and twisted definition? Was I a “successful” woman in this virtual context and, if I was, what does that say about female avatars as played? Was this person just sexist — yes, probably — or more than the assumptions of what gender is, even in a virtual environment, subject not to the world itself but what players bring with them into its magic circle?